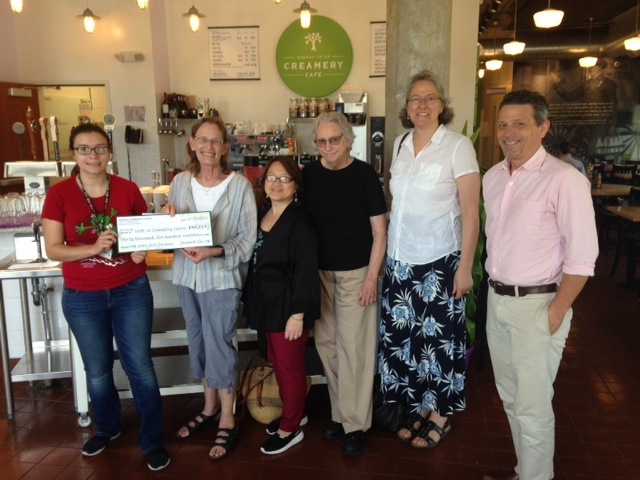 During the month of May, all cash register round-up donations made at Seward Co-op were donated to Walk-In Counseling Center through the co-op SEED grant program. We are so grateful to to the co-op community for choosing Walk-In as a beneficiary of the SEED program! Walk-In provides provide free, no-appointment, anonymous mental health and crisis counseling to all comers, in English and Spanish. Proceeds will support keeping our free services available, meeting increased demand and raising awareness around mental health. In photograph: Argentina Lerma (left) of the Seward Co-op presents the SEED award check of $30,519 to Mary Weeks, executive director of Walk-In. At right is Christopher Dark of Kuzala Macaroons, which also donated to Walk-In as the SEED Grant recipient.